A great cookie recipe for kids to help make this Christmas. Chop your candy canes into small pieces. Beat the butter with the sugars. 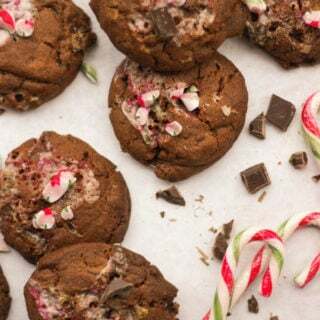 Beat in the eggs, flour, cocoa, bicarb, salt, chocolate chunks, peppermint extract and half of the candy canes (about six) until a stiff dough forms. Form the dough into balls (you can weigh each one if you're that way inclined like me, they should be about 40g each). Freeze the dough balls for at least 2 hours. If you don't have time you can skip this step, it just helps them keep their shape. Pre heat your oven to 180deg fan (160deg conventional). Bake on a lined baking for for 10 - 15 minutes depending on your oven. Serve slightly warm, either from the oven or by popping in the microwave for 10 seconds each before eating.